Kayak fleet SZOT: single, double, triple kayaks, 2-4-person canoes. We offer the best kayaks and canoes of polyester-glass laminate and polythene for recreational tourism. We change some part of our equipment each year in order to our guests' rest will be safety and deliver lots of nice and unforgettable impressions. For your comfort, our base is located in Augustów and Wigry, where you start or finish your kayaking trip from at convenient time. The most STABLE kayak on the market. Secure and comfortable, perfect for longer trips with large luggage, fast, maneuverable. a large storage compartment and displacement chambers. The flat bottom perfectly works out on rivers where are fallen trees and also during winter kayaking. paddles, life jackets (also children sizes), soft seats. Double very fast and maneuverable kayak; perfect for longer trips with large luggage. Recommended for more experienced kayakers. Very fast and maneuverable, lightweight, with heavy dispalcement and capacity. Recommended for more experienced kayakers. paddle, life jacket, soft seat. Combination of comfort and awesome nautics - the best SINGLE kayak. Single tourist-expeditionary kayak in version of one or two hermetic storage compartment. Recommended both for short and long kayaking trips. Mercedes among kayaks - stable and safe, very good manoeuvrability, designed for recreational kayaking for demanding user, also for beginners. Compact shape, a lot of space in cockpits. The most COMFORTABLE double kayak, designed for beginners and experienced kayakers. Perfect for longer trips, large capacity, strength material and very good nautics. Recommended on: rivers, lakes, canals. Possibility to install the small child seat as a triple kayak. paddles, life jackets (also children sizes). Double kayak intended for beginners and experienced kayakers. It very well keep a course. The best TRIPLE kayak. Stable and safe with very good maneuverability and compact shape. Designed for recreational kayaking and demanding users, also for beginners. The centre cockpit intended for a child. TRIPLE kayak with three cockpits, NEW on a market. Kayak equipped with comfortable seats lined with neoprene nad rudder installation. two benches, moulded backrest in the middle, displacement chambers, keel. paddles or oars, life jackets (also children sizes). Double canoe, polythene; perfect for the entire family; stable, it turns easily and manages side wave well , large luggage compartments. It has two moulded seats, centre seat intended for children. classic tourist canoe, intended for whole family. Guarantees dry luggage in case of rain or capsize. It perfectly works out during each kayaking, even one day trip. Guarantees dry luggage and additionally protects equipment such as camera or mobile phones from mechanical damage. Capacity: from 3,5l to 10,4l. Sale price of bag - 85 PLN. 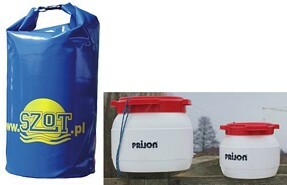 We take a deposit 50 PLN for renting bag / barrel. Igloo-type with double skin and room for luggage. We take a deposit 50 PLN for renting a tent. polythene-Duralumin or aluminium-plastic or wooden paddles, life jackets (children sizes available), soft seats (only for SZOT kayaks of polyester-glass laminate); paddles or oars to canoes. Polythene-Duralumin tourist paddle in straight or torsion version. Very light traditional paddle with alumin barre and plastic feathers. Various sizes. For small children jackets with collar and belt fastened between legs. It is amenities to polyester-glass laminate kayaks only. Irreplaceable by longer kayaking trips.